It has been a blessed time home this holiday season; resting, reading, relaxing. God has been showing me many things about myself, life, direction... and I've also gained a new appreciation for being on the road! After 3 months of intensive ministry, preaching every day and being totally occupied in the work of the Lord, a long break like this (though welcomed) is rather slow. I am anxious to get back at it this coming semester. The New Year is always an opportunity for us to focus our thoughts, motives and plans upon God once again and commit our way to Him. "Commit thy way unto the LORD; trust also in him; and he shall bring it to pass." (Psalm 37:5) A life outside the will of God is no life at all. Jesus came that we might have life and that more abundantly! We ought to ask ourselves: are we living that life? What exactly IS that life? How do I obtain such life? These are the questions that I am asking myself at this time of year. The answer is Jesus Christ. "And this is life eternal, that they might know thee the only true God, and Jesus Christ, whom thou hast sent." (John 17:3) My prayer is that we would all know Christ intimately, and that we would die to our life and allow His life to live in us. Yes Lord! My earnest prayer is that this second half of the trip will be far more glorious than the first. 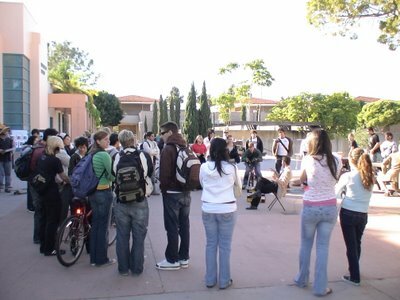 I personally feel that last semester was very much a learning experience and time of experimenting with preaching on campus. Though I know this will continue into the next semester, I want to preach what is right, the right way, in the right place, and see the right results happen. Please pray for me, dear saints. 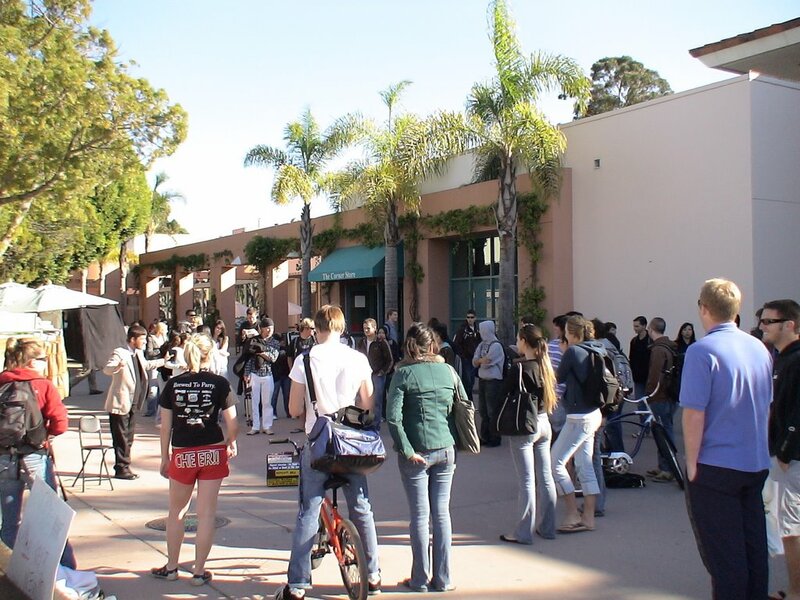 We preached at UofC Santa Barbara for three days, the second most famous party school in the country. Apparently, over 20,000 students pack into an area of 0.5 square miles in a place called Isla Vista to go wild all night long. These are the same students that are studying to become lawyers and doctors and politicians, etc. How far this country has fallen from it's original integrity and Christian hertiage! Today, campuses are thriving with anti-Biblical liberal thought, ravaging the minds of impressionable young students. 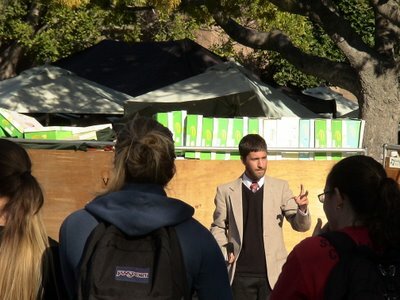 The first day on campus we were having an excellent civil meeting with a group of iniquisitive athiests. They were asking all sorts of questions about the Bible and God and His Son, but then something terrible happened. A handful of students Christians showed up and totally devasted the meeting. They began trying to argue with us about doctrine and would not leave or accept the fact that we did not want to talk to them but to the non-believers. 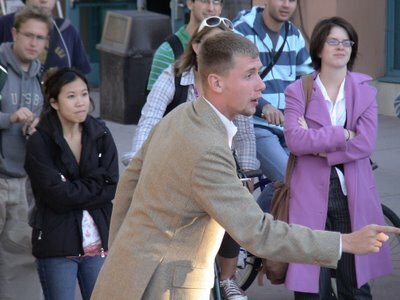 The meeting eventually closed, with the athiests just seeing these Christians arguing with us. It was very grieving. We couldn't believe it. 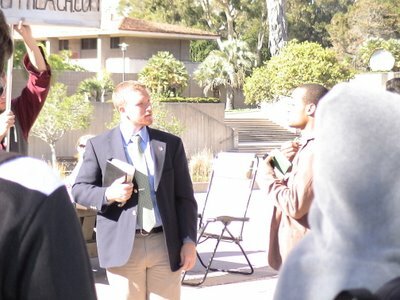 Here is Miles being cut off by a campus Christian. Day two was much better. We prayed that God would prevent that same thing from happening and that day we did not see even one of those contenders who came out previously. Large crowds attended the meeting as we preached hard about sin, righteousness and judgment to come, emphasizing that "we must all stand before the judgment seat of Christ." This seemed to make sense with the students; their conscience condemns their wicked lifestyles. Day three was the best day of our time spent at Santa Barbara. The students very totally civil and the meeting accomplished much. Many people had questions that received answers and others were deeply challenged to get their lives right with God. One man printed off a list of so-called Bible contradictions, but we went through each one plainly until his mouth was completely stopped. A pot smoker had nothing to say when we demolished all his arguments and he saw himself guilty before God. One girl was almost in tears as the Holy Spirit began making an assault on her hardened heart. Evan and I had a great conversation with a Bahai student, who had many questions about Jesus Christ and His second return. Miles reasoned with two evolutionist philosophers and the crowd acknowledged that they were reductio ad absurdum, reduced to absurdity. Two Christian girls and a guy were so convicted about their lifestyles that they started to cry right there in the meeting. Other Christians were encouraged in the Lord; one young man asked us to pray for him that he would have more of a hunger for the Word of God! We also met two Jews for Jesus believers who were a wonderful witness and encouragment to us. God be praised! Thank you, dear saints, for your encouragment to me and for reading these reports; you bless my heart. Lord willing I will be home next Saturday, the 9th of December, for Christmas break and I hope we can get together during that time for fellowship; I know I miss you all dearly and long to see you. May the Lord bless all of us, and strengthen us in our faith and in the Word of God. To Jesus Christ be the glory both NOW and FOREVERMORE.